Singapore (Singapore) – July 18, 2018 (travelindex.com) – The Hotel Management Singapore Summit (HMS) is the region’s leading hotel industry conference produced by international conference producer Questex Hospitality Group. HMS is scheduled to return to Singapore on 20 Sep 2018. Over 150 international senior hoteliers will gather to discuss on how to reinvent the hospitality business model in anticipation of consumer behavioral changes and resources constraints. Themed, “Innovation Enabled Evolutions for Next Generation Guest Experiences and Service Flow,” HMS 2018 will once again provide the platform for the industry’s leading senior hoteliers to further discuss insights, trends, and best practices to ensure continuous successes. From 2018 onwards, slower hotel development pace in Singapore will provide the much needed buffer to the industry. It will allow hoteliers to redirect their efforts into reinventing their business models. This will herald the industry into a new era of hotel operations with automations and innovations. This year marks the beginning of the period to position and prepare for the next round of growth. To succeed, hotels must strive to remain guest-centric, while managing owner expectations, service levels and financial performances. It is imperative for hoteliers to start this process with the right mindset, cultivate the relevant talents, and leverage cost-efficient solutions. Under this prerogative, HMS will help the industry proactively transform to remain relevant to the guests of the future. “Good platform for networking and set to know the technology that other hotels have adopted,” said Sylvia Chua, Procurement Director – Resorts World Sentosa. “Excellent topic and it is very on the trend now. Keep up with what in the trend would definitely more interesting,” said Sandra Widjaja, VP- Finance – YTL Hotels. HMS is a neutral one-stop strategy platform where Corporate CEOs/ Presidents, COOs and CFOs, VP operations Property GMs, Financial Controllers, Director of operations property owners, and managing directors will directly address all key management, operational, commercial, and financial challenges that impact corporate and property P&L. HMS Summit 2018 is part of the Hotel Management Asia summit Series, Asia’s only truly regional hotel management conference series. The series rotate through Bangkok, Hong Kong, Singapore, and Indonesia this year by leveraging regional experiences, insights, and innovations to address market-specific challenges. This division of Questex is aligned around three broad market segments – hospitality, travel, and meetings – and supported by its digital media staff. 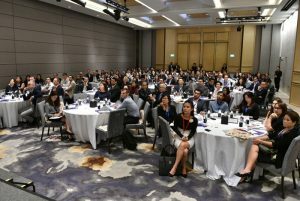 The leading conference in Thailand that directly addresses all operational/management challenges, the Hotel Management Singapore Summit provides a platform for hotel executives from both corporate level and property level to discuss key operational, branding and financial issues directly impacting corporate and property P&L.